I grew up in the south eating rutabagas and turnips. I always thought turnips had a much stronger flavor and were a little less bitter than rutabagas but for some reason, even though I love turnips, I would choose the rutabaga if I had to choose. Though both turnips and rutabagas may be called turnips and yellow turnips respectively, we always cooked the turnips differently because we would cut the turnip “root’ into cubes and add them to the turnip greens, and only occasionally would we have them cooked and mashed. The rutabaga on the other hand, was the “root” vegetable of choice at our house. Since “our” rutabaga was cooked like most other southern vegetables, in salted water and bacon I wanted to change it around from my childhood memories, and add a new level of flavor to this rutabaga recipe. I still wanted to use bacon, and salted water, but not together. So, I cooked the rutabaga in salted water, but then the seasonings came from the bacon that I fried, and the caramelized onions and sage that I added to the cooked, drained and mashed rutabaga. This way I could control my seasonings and fat as well as flavor. 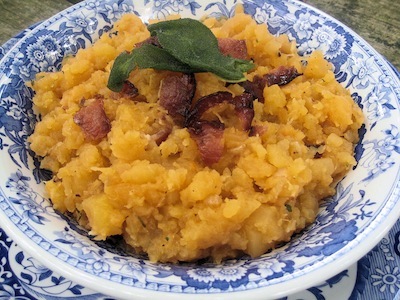 The rutabaga that I cooked was a deep orange color and slightly sweet after cooking, and the bacon was crisp and smoky with a deep woods flavor. The caramelized onions added a little texture and the sage added a taste of fall and all the flavors that go with it. I know that some cooks may not like to use as much bacon as I did, so drain the bacon fat and use olive oil to caramelize the onions and sage. You’ll see what I mean when you read the recipe. Then crumble the drained bacon into the rutabaga. There is nothing wrong with the old way that rutabaga was cooked. If someone invited me to sit down to a bowl of rutabagas cooked in salted water with bacon, I wouldn’t be able to get there fast enough, especially if there was some cornbread on the table to go with it. You see, you can take the girl out of the country, but you can’t take the country out of the girl. Peel the rutabaga and slice into ½ inch slices and then into ½ inch cubes. Cook the rutabaga cubes in boiling salted water and the ½ teaspoon sugar. This will help take out some of the bitterness. Cook until the rutabaga is very tender. Just before rutabaga is done, cook the bacon in a large skillet. Remove and drain the bacon. Add the onions to the bacon fat, and cook until golden, then add the sage just before removing the onion from the skillet. Drain the rutabaga well. Mash. Add 2-3 slices crumbled bacon, onion and sage, and salt and pepper to taste. Add the last slice of bacon crumbled on top of the rutabaga before serving.